The Benaud Trio is one of Australia’s finest young ensembles. 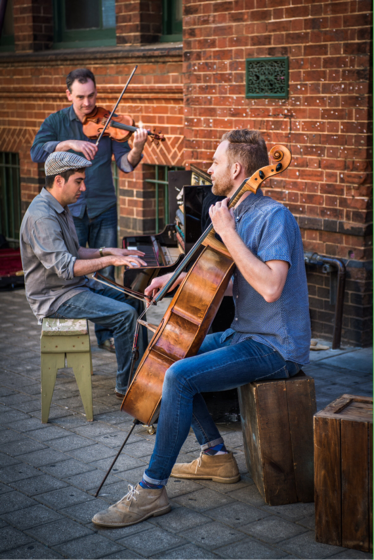 Formed in Melbourne in early 2005, pianist Amir Farid, violinist Lachlan Bramble, and cellist Ewen Bramble have established themselves as formidable performers of the major repertoire, works by Australian composers and are well known for their outrageous pop-inspired encores. The Benauds were winners of the Piano Trio Prize at the 2005 Australian Chamber Music Competition and completed a residency at the Banff Centre for the Arts in July 2006. Apart from their regular appearances at Melbourne Recital Centre and Elder Hall, the Benaud Trio has given many performances in regional centres including Ballarat, Castlemaine, Mount Barker, Port Fairy, Flinders and Mount Macedon. The Trio has also performed in Sydney and Hobart and were Musicians-in-Residence at 3MBS FM from 2007 to 2009. The Benauds were recipients of the 2013 Contemporary Masters Performance Award at Melbourne Recital Centre and has two acclaimed albums available on Melba Recordings. Please visit www.benaudtrio.com for more information.